Here's why Apple, Walt Disney, and Nike should be in every income investor's portfolio. Apple (NASDAQ:AAPL), Walt Disney (NYSE:DIS), and Nike (NYSE:NKE) aren't your typical dividend stocks. Usually trading with lower dividend yields than most popular dividend names, they are often overlooked. But these three stocks are better income investments than you might think -- especially after the market's recent pullback. 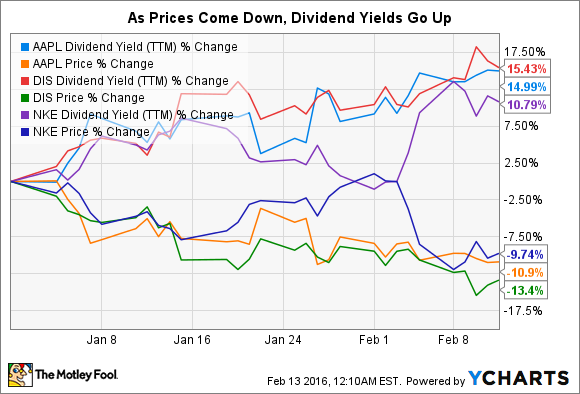 Income investors love dividend yields. But they also love stocks that appreciate in value over time. The problem is that stocks with meaningful upside potential often have dividend yields too small to make them worthwhile for income investors to consider. So, faster-growing companies with dividends tend to get passed up. Unless, of course, their stock prices fall in a bear market and their dividends yield become enticing enough to consider -- and this is exactly what is happening recently. Thanks to a bear market, income investors may now get their chance at three faster-growing market leaders. Year to date, shares of Apple, Disney, and Nike have all taken a turn for the worse. These three stocks are down about 11%, 13%, and 10%, respectively, during this period. And since dividend yield is equal to a company's dividend payout as a percentage of its stock price, lower prices mean higher dividend yields, making them more attractive to dividend investors. During this same period, Apple and Disney's dividend yields increased 15%, and Nike's dividend yield increased 11%. Here's a close look at each of these three companies and why they could make great dividend stocks for income investors. With the highest dividend yield of these three -- at 2.2% -- and the fastest growing EPS, Apple jumps out as the most attractive deal among these three stocks for dividend investors looking for income while also expecting share price appreciation. It's also worth noting that Apple's dividend looks enticing because of its low payout ratio, or the percent of earnings paid out in dividends. At just 22%, there's plenty of room for further increases. As a bonus, over the long haul, Apple's dividend yield will also likely benefit from the company's share repurchase program Apple continues to aggressively buy back its shares when the price is right (and it's looking right today). By reducing total shares, the stock should see an outsized gain in dividend yield compared with any future hikes to its payout ratio. Disney's yield, at 1.6%, is well behind Apple's, but where Disney stands out is its dividend history and EPS predictability. The company has been paying out dividends since 1957, clearly demonstrating its dedication to income investors. And Disney's EPS is far more predictable than Apple's, with its profits coming primarily from services. On the contrary, Apple's EPS is derived primarily from unpredictable product revenue (over 60% from the iPhone alone). Nike, too, has a solid dividend history. The apparel company has paid out dividends since 1984 and it has increased its dividend every year since 2004. Investors can count on the company's iconic global brand, paired with Nike's proven ability to execute and grow its business consistently, to continue to drive more EPS growth and dividend increases in the future. Its dividend yield, at 1.1%, is the weakest of the three. But the company's growth opportunity ahead may face the least uncertainty. Going forward, Nike has ambitious plans to grow sales 10% annually between 2015 and 2020 -- an acceleration from the 8.5% annualized growth the company was achieving in the years leading up to 2015. This revenue growth should drive EPS growth and, ultimately, dividend growth. Do you own any of these stocks in your portfolio?